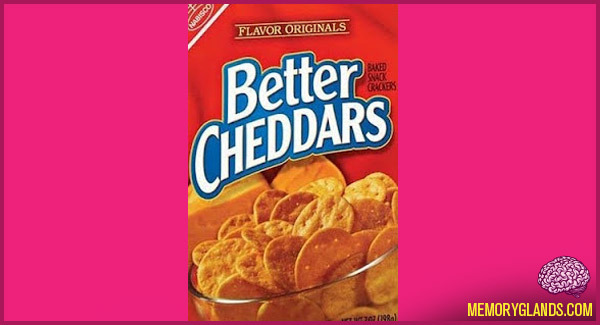 Better Cheddars is a brand of baked snack cracker manufactured by Nabisco, a subsidiary of Kraft Foods, Inc. In the United States, Better Cheddars are marketed under the “Flavor Originals” trademark, which also includes the Chicken in a Biskit brand. Better Cheddars were first introduced by Nabisco in February 1981, and originally had sourdough culture in its ingredients. They were advertised on television as the “San Francisco-style” snack cracker, and were the first commercials featured actor/comedian Ron Carey as a cable car operator singing the Better Cheddars theme song and eating the snack. The name became a registered trademark in February 1985.